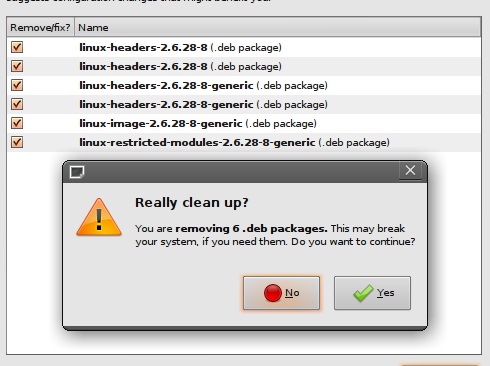 After choosing one or more of the packages Computer Janitor offers me for removal, I'm shown a confirmation alert box where it suggests that this action "may break my system, if I need them". Users who know the packages they don't need can be assumed to be able to clean them up themselves, without having to rely on Computer Janitor's judgment. For users who don't, the sentence "This may break your system, if you need them" will only create fear and confusion: if the packages may still be needed, why did the software offer to remove them in the first place? Can its judgment of what is needed and what isn't not be relied on? And if not, how is the non-technical user supposed to know whether the action will "break her system"? Title: Are you sure you want to remove these packages? Body: You are about to remove [n] software packages. Please verify that they are no longer needed on your computer. Do you want to continue? I'm not sure which wording would be better. I would like it if people who don't know what they do would not accidentally remove packages by mistake, and thus I chose a fairly severe wording. I'll be happy to reconsider the wording for karmic. For jaunty, we're past the string freeze, so any changes to it would require a freeze exception, and I'm not currently sure it's worth it. I'm happy to be convinced otherwise by enough people telling me they really hate the current wording. This one is waiting to be fixed, do we like the initial proposal, or does the message need to articulate the warning more strongly? I'm not sure the "Are you sure you want to remove these packages?" will help either, but then again, I would call the entire janitor a papercut. A user seeing that message will probably be afraid too and close the janitor. That is a lot more likely than the user starting to googling every package to check if it's safe to remove. I have said so before, and say it again; the computer janitor should not even offer to remove packages the user needs! How do we know what the user needs? He probably wants to keep the manually installed packages at least..? I agree with Åskar. I raised the dupe of this bug - my main problem with Janitor is that either it needs to take responsibility and just remove the packages with confidence, or it should provide all the info that the user needs (in a form the user understands) to make the decision. Saying 'Are you sure?' is pointless. Very well, let's remove janitor. I am not ever confident enough to say that specific packages are always safe to remove. I think Janitor should remain, but there needs to be a way to differentiate between user created cruft (manual packages) and system created cruft. Perhaps having a history of changes would help (with the ability to rollback/reinstall). Then users could be more confident knowing that, should things go wrong, they can always come back and click undo. This somewhat relies on the assumption that users who don't know what they are doing would stick to software from repos, which could easily be reinstalled, but if less technical users are being forced to manually install debs then that sounds like another paper cut. Mockup reflects change in wording (in labels and on buttons) only. I'll take a look at it. If not heard from me in a day I didn't have the time. I am still convinced that until there is a reliable way to detect packages that are safe to remove (and solve the halting problem), toning down the wording such that people will (again) remove packages they want to keep and thereby break their systems is a bad idea. I don't wish that to happen. So, should I change the text? I don't think we've "toned down" the text. We give the user fair warning that removing packages can cause errors, and we ask for an administrator's password. In lieu of solving the halting problem, Marcus, please proceed. After running the application I'm not sure if we should call it "remove packages" as it's not only packages that will be removed. As in my attached screenshot - it also shows a file that will be removed. However, I've created a patch with the new text. Please review the patch as I'm not that sure of the correct way to set buttons text/icon. 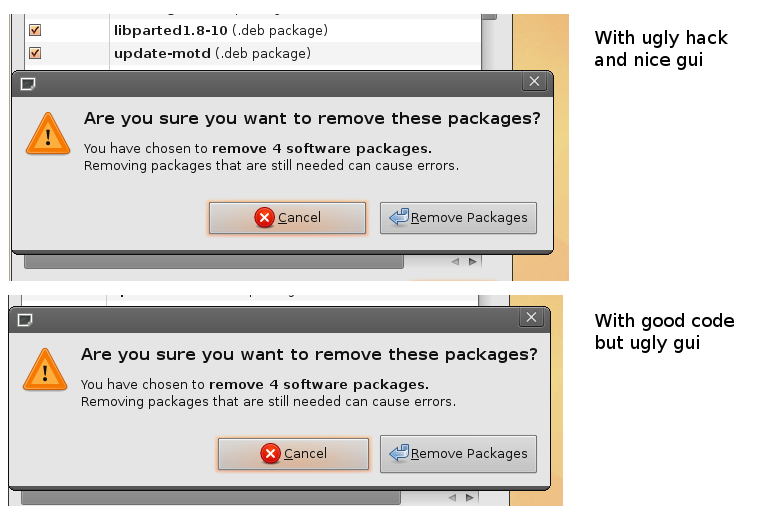 Also if no packages is selected - the message is just: "Do you want to continue?" If I'm reading the patch correctly, it seems that you're changing the response types in the buttons but not in the actual dialog response handling. The response types were GTK_RESPONSE_YES and GTK_RESPONSE_NO before..
And here the buttons added use GTK_RESPONSE_YES and GTK_RESPONSE_CLOSE. If I'm not missing anything here, the cancel response code is not important. Okay cool, I didn't look at the full code only the patch. I'm at Guadec and the network isn't responding very well, so I never got to respond to your actual question.. so here is my only other thought on the patch. +	#FIXME: is there a better way to set the title AND have a stock icon? Sorry, I'm not familar with pygtk so this is the best I can offer. It's up to you, this is just a suggestion that I think makes the code a little bit more obvious in my opinion. Thanks Matt, that looks much better. I'll change my patch later. As a snew Ubuntu user (non-programmer), I like David Siegel's mock-up on post #10 best. Matt, I tried your code but the button gets higher than the cancel button, see attached screenshot. Why? Hmm, I just tried it and the buttons were the same size for me. Maybe something like this will work better? I have no idea why the size would be different; I'd never heard of either method changing the button size. Replacing the text "Really clean up" with "Are you sure you want to remove these packages?" is wrong. The janitor does not just remove packages. Note also that I'm replacing the entire UI with a new design and implementation, see the lp:~systemcleaner-hackers/systemcleaner/new-ui branch. Lars, will your updated UI land in Karmic? David, yup, once I polish it some more and get back home. Awesome. Please update this bug when it does. The upload is still processing as I'm writing this, the version of interest has ppa5 at the end. The issue is more complicated than the mockups that have been posted in this bug allow for. CJ does not only remove packages, it does other kinds of things as well. That's why all wording specific to package removal needs to be adjusted if there's other stuff happening as well. However, I'm capitulating and accepting the toned down wording. I expect this will cause a few people removing stuff they shouldn't, but I don't expect to have to deal with the bugs after karmic so I don't have the energy to stand my ground on this issue, either. * Packaging now uses dh from debhelper 7. I'm perplexed by this bug. To sum up things, a user with a perfectly working system may ask Computer Janitor to do some cleanup. Then Computer Janitor will suggest to remove some packages. If the user decides to follow this advice, Computer Janitor will then warn him : "Hey ! Don't play fool you may break everything"
It's unfair that Computer Janitor gives non-reliable advices and ask user to assume all responsibility. What you mention is the subject for a separate bug report. Kindly open a separate bug report.